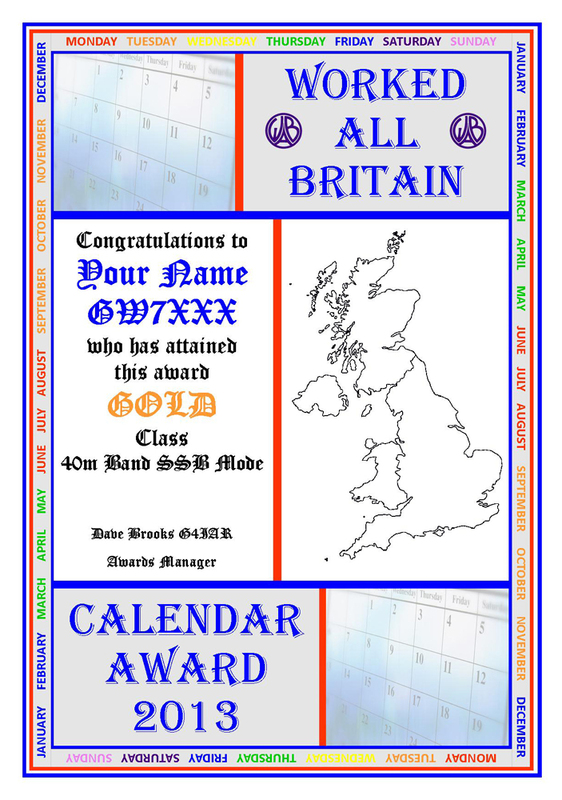 Please Note: The Calendar Award has now finished. No further Award claims may be made. Since we introduced the award for our Ruby Anniversary, W.A.B.�s "one off" yearly awards have proved very popular with our members, especially those long in the tooth, who liked something new to go for. One comment made, however, is that it is much easier for those who have a lot of free time to achieve these awards and in fact, in some cases, they are achieved within a few weeks of their inception. With this in mind, we have tried with this award to make it span over more of the year by including time factors. The top stage of the award cannot be achieved until October at the earliest. In common with all W.A.B. awards, it will be available to non-members upon receipt of the appropriate fee. HF is defined for this Award as 1.8 MHz and higher, VHF is defined as 50 MHz and higher. Basic - 90 squares in total, these must be worked in any 3 months of the year. Each month must show 30 squares that have not been claimed in previous months. Bronze - 180 squares in total, these must be worked in any 6 months of the year. Each month must show 30 squares that have not been claimed in previous months. Silver - 270 squares in total, these must be worked in any 9 months of the year. Each month must show 30 squares that have not been claimed in previous months. Gold - 365 squares in total, these may be worked over the whole year. 10 of the months must show at least 30 squares that have not been claimed in previous months. Note: The extra squares required for this level of award may be claimed as more than 30 in the relevant 10 months, any amount in the other 2, or as a combination thereof. Basic - 45 squares in total, these must be worked/activated in any 3 months of the year. Each month must show 15 squares that have not been claimed in previous months. Bronze - 90 squares in total, these must be worked/activated in any 6 months of the year. Each month must show 15 squares that have not been claimed in previous months. Silver - 135 squares in total, these must be worked/activated in any 9 months of the year. Each month must show 15 squares that have not been claimed in previous months. Gold - 180 squares in total, these may be worked/activated over the whole year. 10 of the months must show at least 15 squares that have not been claimed in previous months. 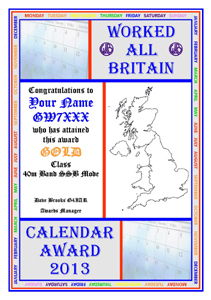 Note: The extra squares required for this level of award may be claimed as more than 15 in the relevant 10 months, any amount in the other 2, or as a combination thereof.